It's time to take a dip into this week's The Sims Social update, Pool Party Week. Playfish has allowed players to place an in-ground pool next to their vacation homes in Littlehaven Shores. 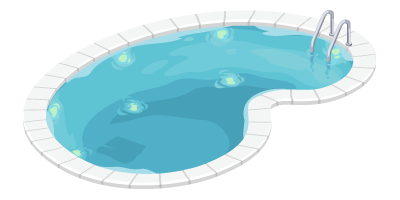 Of course, with such an update comes plenty of quests to complete, but the one connecting them all together is known as none other than "Pool Party." Luckily, the five-step quest doesn't look terribly difficult. Here's everything that you need: five Blue Essence, five Sponges, 12 Delicious Morsels, 15 Goodwill, 15 Relaxation and a Sofa. Without further delay, here's how to finish "Pool Party fast. Visit Bella's Beach House to Say "Hello"
For this first task, visit Bella's Beach House, click on her and use the 'Hello' action. To gather Blue Essence, you must click on Blue items and choose the "Gather Blue Essence" option. (Save energy by visiting friends' houses.) Finally, visit Bella's Beach House, click her and choose the "Cocktail" option to finish this goal. Sponges are found by performing Hygiene interactions on Baths and Sinks. (Try this at friends' houses to save energy.) Then, visit three friends, click on them and ask them if they want their Swimming Pool cleaned using the relevant option. For the final requirement, go back to Bella's Beach House and choose the "Jump In" option on her Swimming Pool five times. Delicious Morsels come from performing interactions with Fridges and Microwaves. Harvesting eight Pumpkins will take at least eight hours and cost a total of 104 Simoleons. (Start with this task first!) 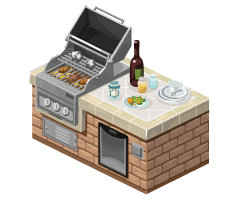 Finally, go back to Bella's Beach House, click on her Re-Lux Deluxe Grill and choose the "Cook For Pool Party" option twice in two days consecutively to complete this task. Pro Tip: The game clock resets daily at 12 p.m. GMT. Use a Re-Lux Premier Hammock to "Procrastinate"
To score 15 Goodwill, perform friendly interactions with friends. 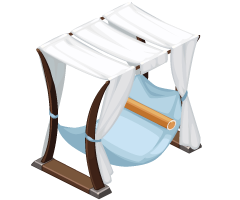 Find a Re-Lux Premier Hammock in Bella's Beach House, click it and choose the "Procrastinate" option five times. To search Wardrobes or Closets, just use the "Search" option on five different ones in friends' houses. For the first task, eight friends must click on the post that's placed on your Facebook Wall. The 15 Relaxation will come from performing relaxing interactions on items like Beds, Hot Tubs and more. Finally, the Bahama Stone Shower is all yours. Have any other tips for finishing this quest even more quickly? Share with us in the comments. Add Comment.